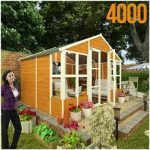 This large log cabin can transform not only your garden, which it will do with its attractive and stylish appearance, but your home as well. 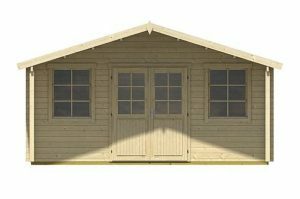 It has very generous dimensions, which means that it’s a very versatile building that can be used for lots of different functions, from a playhouse for the children in your life to a workshop for a small scale business. We also really liked the veranda area, which is a perfect place to sit and enjoy your garden while still being protected from the elements. Weather protection is a feature of the log cabin as a whole. 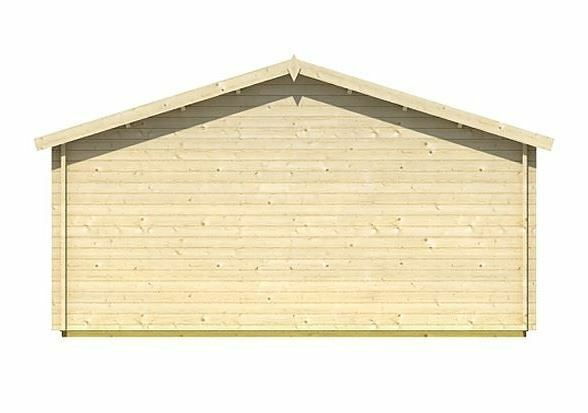 The tall apex roof means that rainwater simply bounces off, and this is also accomplished by the tough tongue and groove cladding. 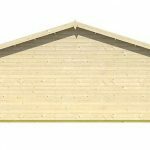 Unlike some cheaper garden buildings, tongue and groove is used across all the surfaces, including the roof where it’s then topped with mineral felt. Thanks to these qualities, the manufacturer has provided a 15 year anti-rot guarantee. We were also pleased to see that the large double doors are secured by a key operated locking system. When taken in conjunction with the double glazing used on the doors and on the three sash windows, this creates a secure place in which you can keep furniture, electrical items such as a television, or anything else you wish. 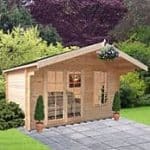 This large apex roofed log cabin allows you to make the most of your garden, both inside and outside, thanks to the inclusion of both a large interior space as well as an accommodating open veranda that’s protected by the overhanging roof. It creates the perfect area to sit around a patio set, or to set up a hammock or barbecue. We were really impressed by the aesthetic appeal of this cabin, and liked its classic rustic design. 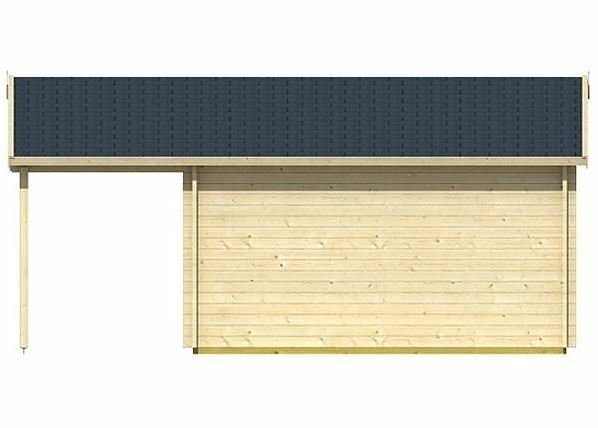 At the top of the shed is a large apex roof that contrasts nicely with the wood below thanks to its black mineral felt covering. It’s not only effective at keeping rain and snow out, it also ensures a very generous vertical space. 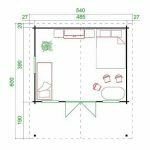 The peak height is 2.79m and the eaves height is 2.03m, which demonstrates that the owner will never be lacking in headroom. 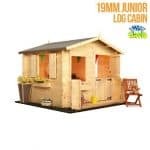 The overall width of this log cabin is 4.85m and the overall depth is 3.90m. We take a keen interest in the cladding of buildings that we review of this size, as strong and tough cladding is essential to create a stable whole. That’s exactly what we found here, with thick cladding of 44mm giving a strong and rigid finish. Stability is also helped by 44mm roof joists and corner joints and chalet connections that give added strength where it’s needed most. We were pleased to see that 19mm tongue and groove cladding had been used for the floor, just as it has for the roof, as this creates a more than adequate floor for most purposes. Even more importantly, it’s supported by floor bearers that elevate the base above ground level and in so doing protect it from the threat of ground moisture. It’s essential that a timber building as large as this is given adequate protection against rot. Unfortunately, however, there has been no preservative pre-treatment applied by the manufacturer themselves, but rather they instruct the customer to add preservative after installation and at yearly intervals after that. If this schedule is adhered to then a 15 year anti-rot guarantee is available, but we would have liked this to be provided along with the reassurance of an initial dip or pressure treatment. The double door of this shed is as attractive as its surroundings, thanks to its half glazed panels. It’s also very accommodating with an opening width of 1.58m and a height of 1.95m. These are both in excess of those we normally see on the cabins we review, and can come in particularly handy when moving furniture or machinery in and out. As well as the glazed doors, there are also three full sized windows. As these are double glazed they’re good at keeping noise out, but being sash windows they can also be opened to provide ventilation and cooling air when needed. 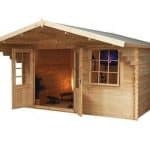 Thanks to this, the interior is both light and refreshing, making it a pleasant environment to be in even if you’re going to be inside the log cabin for hours at a time. With such a large and imposing building, security is paramount, so it was good to see that a secure key operated locking system has been included as standard. If you do plan to keep valuable items inside then we would also recommend the addition of an alarm system or even a security camera, but the lack itself will act as a good deterrent against opportune thieves. There are three sets of optional extras available, but the one we’d really say is an essential purchase is the 4l tub of Garden Wood Protector from Cuprinol. It’s necessary to use a high quality wood preserve immediately after installation and this product, available in either spruce green or golden oak varieties, is more than suitable for the task. 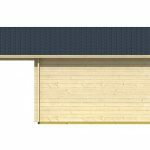 Other optional extras include a roof shingle set and a selection of five solar panel kits that can be used to generate greener electricity. These solar panel kits range in price from £699.95 to £3217.95, so there’s something for all budgets. This large log cabin has a lot of components, but we were pleased to see that high quality was maintained throughout. The use of pressure treated timber would have enhanced the durability of this building, but with high quality cladding used it should still be long lasting as long as the treatment schedule is strictly adhered to. 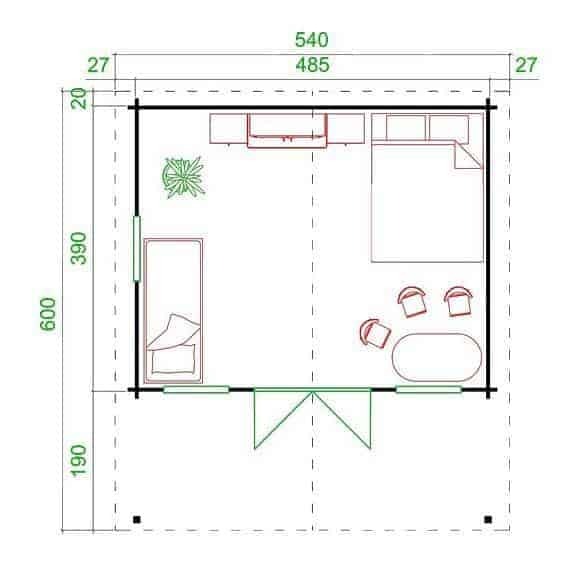 There’s more than enough space here to place a double bed in, table and chairs, and a large television. The tall eaves height also creates additional space, as does the veranda. Full instructions, which are comprehensive yet easy to follow, and an assembly kit are included, but it can still take at least eight hours for a minimum of two people to install. 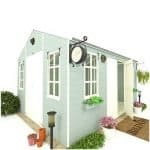 This isn’t the cheapest garden building, but if it’s within your budget then this still represents good value for money thanks to all of its features, its space, and its attractive design. 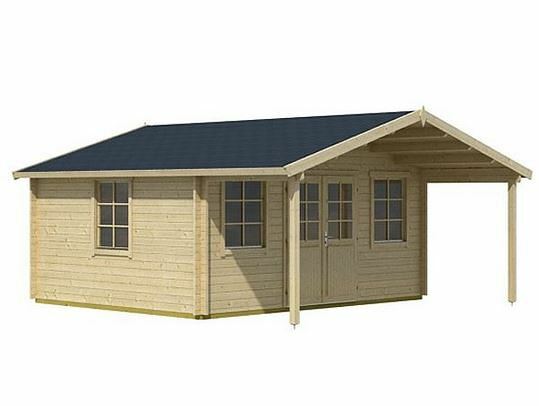 Final Thoughts: If you’ve found yourself running out of space in your home, or longing for the versatility than an extra room or two will bring, then this well proportioned log cabin could be the solution you’re looking for. 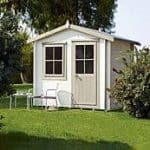 You won’t have to go to the stress and expense of moving house, because this garden building can give you all the space you need. It could be used as a lounge, games room, utility room, a luxurious home office, or even spare living quarters to house guests. With so much space, and lots of light and ventilation provided as well, it’s a very pleasant place to spend some time in.